While I was racking my brain trying to figure out what to send to LCpl Honda in his Christmas Care Package I started doing a little research on the internet. 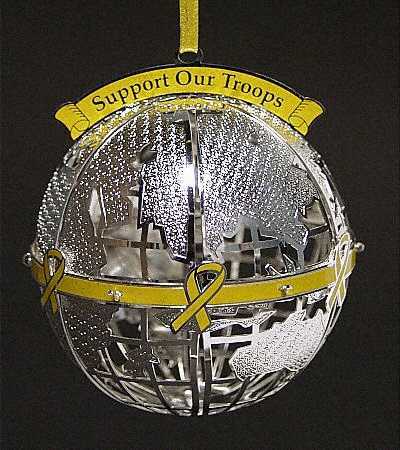 I found many great charities and companies that focus on making Christmas for our deployed service people a happy day. If you are wondering, what you can do here is just a few of the ideas that I came across. 1. Send a USO care package to a deployed service member. Operation USO Care Package will send a care package to those either deployed or en route to an overseas deployment. 2. Operation UpLink provides phones cards for deployed military members. Being able to call home is a priceless gift you can give to a military member and their family. 3. Christmas Spirit Foundation donates Christmas trees for military families. What a wonderful gift for the family back home! Being separated from loved ones during the holidays is stressful to say the least. The Christmas Spirit Foundation provides trees and helps families with one less thing to worry about during the holidays. 4. Donate toys to the Marines Toys for Tots program. This benefits all children whether in the military or not. Besides, Christmas is all about the kids and the Marine Corps has successfully made a wonderful Christmas for kids since 1991. 5. Adopt a Soldier. This is the gift that keeps on giving. You can adopt a military member and help by sending care packages and letters throughout his/her entire deployment. Whatever you choose to do is up to you but this is just five ways you can help and bring some holiday spirit to those who are making it possible for us to celebrate the holidays in freedom. In Sullivan Illinois, the residents have found a great way to honor their military residents serving in the US Armed Forces. When many were deployed to Afghanistan in 2004, the soldier’s names were nailed to lampposts. As more and more young people volunteered in Sullivan, population 4,400, the parents decided to keep up the tradition. More than a hundred town residents have served abroad and dozens more will still deploy to either Iraq or Afghanistan. Some names have hung more than once while spouses and siblings are displayed two to a post. This is the town’s small, informal way of showing its respect to those members of the community who for the most part joined the military out of patriotism. In Sullivan, the effort to support military personnel and their families includes churches, care package packing parties and coffee klatches. The wonderful thing here is the residents have taken their support an additional step by putting up the signs and honoring their military even further. As we military family members know, support is imperative during deployment. It is hard for non-military people to understand the fear and helplessness when a loved one deploys for a war zone. The signs are a great way of reminding people on a daily basis that someone’s family member is in harm’s way and protecting each and every one of us. Since my son will soon be deployed my need for support and understanding grows with each passing day. I think doing something like this in my hometown would be a great comfort to me. Maybe since this story is out other towns might want to do something like this too. So I say spread the word and maybe this could grab some momentum and before we know it many towns and cities could be demonstrating yet one more way to say thank you to our brave military. Please visit my other blog - juliannah by design.